Remember your guests are special, listen to them, buy quality ingredients, prepare their favorites with care, and serve them with a smile. This is the concept that the Parsons family has followed for over 40 years in the hospitality business. Proudly Matthew’s 1600 has been the neighborhood hot spot since opening day. We strive everyday to make guests happy and in turn continue to make new friends. Matthews 1600 main building was erected circa 1862. This century and a half old building began its long history in the hospitality trade as the Terminal Hotel. It was a waiting station at the end of the line for the newly formed Frederick Road horse car line. Meals were served on the first floor, rooms for overnight stays on the second floor and attached stables on the west side of the building. James William Stoddard (1866-1961) was one of the drivers for the horse car line in 1883 and by the late 1880’s he purchased the Terminal Hotel. In the 1890’s, Mr Stoddard added a frame structure adjoining the east side of the hotel which he names the “Palm Garden”. Picnic tables and swings were added on the lawn surrounding the building. With the advent of electricity, the horse-car line was to yield to the electric street car in the 1890’s. This became a popular stop on the line. In the 1920’s The Terminal Hotel was purchased from Mr. Stoddard by Sidney Reinach and the name was changed to “Reinach’s”. After removing the stables, Mr. Reinach added an elevated trellised porch on the west side of the building. Decorated with colored lights and an oom-pah band playing, it had the appearance in the summer months of an old fashioned German Beer Garden. 1880’s: Occasional jousting tournaments were held on the lawn and enjoyed by large crowds. 1920’s: Reinach’s was raided during prohibition and liquor was found in hidden window seat compartments. Through the years stories of ghost viewings were reported. Some saw civil war era soldiers, others witnessed a woman in a long dress and apron, and some heard music. The woman in the apron is thought to be the spirit of Amelia Reinach, who operated the business from 1919-1948. All reports were of happy spirits, no menacing energy. From 1950 to 1975 the building was known as “The Ridgeway Inn.” In 1976 the building was operated as “Snyder’s West” followed by Jules Loverde’s disco in 1980, Russels Ltd. from 1983-1993, and then “The Warfside Inn” in the 1990’s. In 2003 and the early part of 2004, the building was completely renovated. They would love to add a larger porch, called the “Palm Garden” as an homage to Mr. Stoddard. 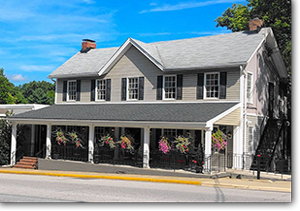 Matthews 1600 Restaurant & Bar opened July 6, 2004 and is owned and operated by Al & Lori Parsons and their three sons, Russell, Matthew, and Daniel.